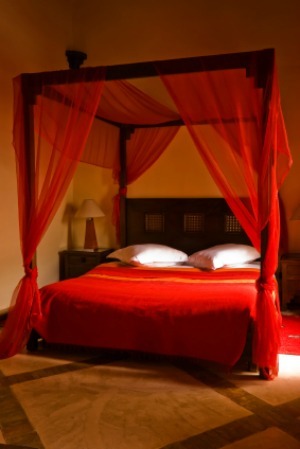 Bring a touch of the exotic to your bedroom and create a romantic, spicy atmosphere with a Moroccan-inspired bedroom. From deep rich colours, to opulent accessories, here are five steps to an intoxicating look. Warm, rich and deep colours are essential when creating a Moroccan-themed room. Opulent reds, golds and burnt oranges are the perfect shades to instantly transform your bedroom. If you are struggling for inspiration, think of the colour of the spices that you may associate with the country – saffron, gold and warm cinnamon reds. Choose intricately carved, dark furniture to continue your Moroccan theme. Such richly coloured wood will offset the other colours in the room to create that exotic atmosphere. If you don’t want to throw out your old furniture, than consider varnishing it a deeper colour or invest in one feature piece such as a screen divider. Moroccan candle lanterns will instantly give a beautiful Moroccan feel to your bedroom. To transform your current lamps, replace your lamp shades with a more eastern-inspired one or select a rich, deep colour for a soft and exotic atmosphere. Hanging lanterns made of glass, punctured tin or even fabric and paper lanterns are perfect for the North African look. 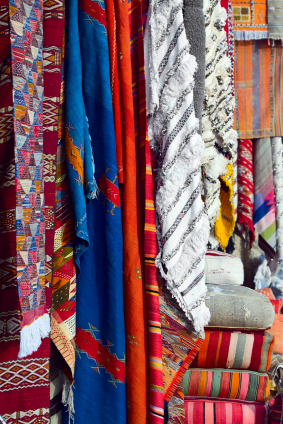 Moroccan prints can be extremely intricate and beautiful, and with so much variety you are sure to find something you like. Add scatter cushions to your bed with different fabrics and prints to create the feeling of a Moroccan boudoir. For your bed keep the cover simple – go for a neutral cream or white colour and then add a splash of dramatic colour with a red or purple throw. Your bed should look as relaxing and inviting as possible, so don’t over-complicate matters with too many prints. For intimacy drape lightweight fabric around the headboard or attach it to the wall above and simply let it hang down and around the bed. Iron and heavyweight accessories add a finishing touch to your bedroom. The heaviness of iron perfectly complements the vibrant and rich colour scheme. Choose mirrors, photo frames and vases with heavy metal frames and elaborate designs. Other exotic-inspired trinkets with small pieces of glass or bejewelled designs will also give the bedroom a special decorative touch.